Moscow, New York – Russia on Wednesday vetoed a UN draft resolution that calls on the Syrian regime to cooperate in investigating a chemical attack in the province of Idlib last week. It was the eighth time during Syria’s six-year-old civil war that Moscow has used its veto power in the Security Council to protect Assad’s regime. 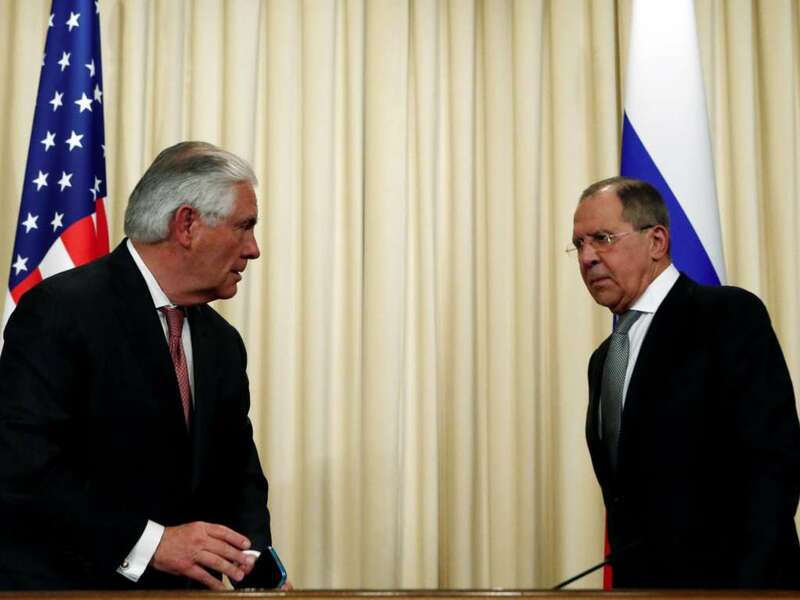 The UN Security Council session coincided with the visit of US Secretary of State Rex Tillerson to Russia and his talks with Foreign Affairs Minister Sergei Lavrov, a meeting that was charged with tensions and criticism. During a joint news conference, Tillerson stressed the low level of trust between the two countries. However, the two officials agreed to work to overcome differences in order to promote cooperation in fighting terrorism. The US secretary of state reiterated his country’s stance that Bashar Assad must relinquish power in Syria. He noted that the Syrian leader’s departure must happen in an “orderly” way. On whether Assad should be charged as a war criminal, Tillerson did not rule it out, noting however that doing so would require clearing a legal hurdle. In response, Lavrov said that attempted ousters of dictators are never ultimately successful. “A successful ouster of a dictator is very hard to remember,” he stated. On last week’s chemical attack that hit the area of Khan Sheikhoun in Idlib, Tillerson said it was “conclusive” that Assad’s regime was behind it. Lavrov, for his part, said Russia was insisting on holding investigations into the incident. “As for the investigation into the incident, there is a fact-finding mission of the OPCW, there is also a joint mechanism for an investigation set out together by the OPCW and the United Nations,” Lavrov said. The US secretary of state met with President Vladimir Putin in the Kremlin after talking to Lavrov during a three-hour encounter. Meanwhile, Putin said in a televised interview on Wednesday that trust between the US and Russia had deteriorated under President Donald Trump. During a press conference with NATO’s secretary-general, Trump, for his part, said that the US “may be at an all-time low” in its relations with Russia. Back to New York, US Ambassador to the UN Nikki Haley said that Russia would continue to be isolated from the international community, in the wake of the Russian veto of the draft resolution. For his part, UN Special Envoy for Syria Staffan de Mistura called on the United States and Russia to “find a way to work together” to stabilize the situation and support the political process in Syria. “This is a time for clear-thinking, strategy, imagination, cooperation,” he noted. “We must all resolve that the time has come where the intra-Syrian talks move beyond preparatory discussions and into the real heart of the matter, across all four baskets, to secure a meaningful negotiated transition package,” he added. Concluding his briefing, the UN Special Envoy reiterated that there are no military solutions to the strife in the war-ravaged country. “You have heard it countless times, but I will say it again: there can only be a political solution to this bloody conflict […] regardless of what some say or believe,” he said. “So, let us use this moment of crisis – and it is a moment of crisis – as a watershed and an opportunity perhaps for a new level of seriousness in the search for a political solution,” the international envoy concluded.